It has been truly said that there is no part of India which is more interesting in some respects to the student of Hinduism than the Assam Valley. The fundamental streams of the Brahmanical religion had penetrated into Assam at an early period. Saivism, Saktism and Vaisnavism held sway in various forms. These cults underwent certain modifications in Assam. It is true especially of Saktism. In India sculpture, fine arts and literature are closely connected with religion. It is the religion which fostered the growth of temples and images. In Assam also temple building and the arts of architecture and sculpture grew hand in hand with the spread of religion. The erection of temples in Assam goes back to an early century. At any rate, the existence of numerous shines dedicated to Siva, Surya, Vishnu and Devi and other deities is fully attested to both by inscriptions and contemporary literature. But today not one of these early edifices exist, and the only memorials of ancient times consist of jungle clad mounds scattered in such places as Gauhati, Tezpur, Nowgong, Sibsagar and a few big temples belonging to a comparatively late period. The reason for this total obliteration of old-sities as given by Gait, is that nature has vied with man in destroying them. The Brahmaputra Valley is an alluvial country, and the impetuous, snow-fed rivers which debouch from the Himalayas find so little resistance in its friable soil that they are constantly carving out new channels and cutting away their bank; consequently no building erected in their neighbourhood can be expected to remain for more than limited time, except at few points like Gauhati, Tezpur, where solid rock pierces through the alluvium. Further though occurring at distant intervals, violent earthquake are, in Assam quite as great cause of destruction as Fluvial action. A less sudden, but almost equally potent, cause of damage is found in the luxuriant vegetation of the country. Instances are also not wanting where religious zeal led the early Moslem invaders to raze the temples to the ground. 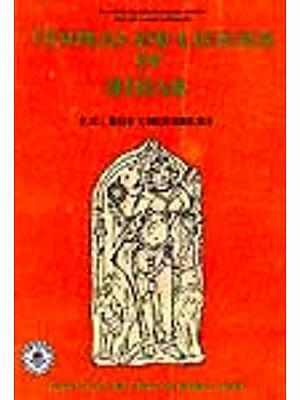 We have therefore very little material for the study of temples in Assam although there are quite a few legends. We have here selected some of the important ones and have also added a chapter on Vaisnava religious centres or Satras so as to make them intelligible to those outside Assam. The book is a joint work of Dr. B.K. Barua and myself. In fact, immediately after the receipt of the letter from the Bharatiya Vidya Bhavan Dr. Barua invited me to associate with him in the preparation of the work, before we could take it up we had to complete the work in hand which was a revision of A history of Assam by E.A. Gait. After the completion of it, we took up the present work and prepared the draft. But before we could finalise the draft, Dr. Barua left for USA as visiting Professor in the Indiana University. After his return from the States, we finalized the draft and were about to send it for typing, when suddenly Dr. Barua was taken ill and passed away. Therefore I have written this preface on the lines we had thought out originally. I would like to take this opportunity to place on record my deep debt of gratitude to Dr. B.K. Barua for giving me an opportunity to associate myself with this publication. I am grateful to Mrs. B.K. Baura for kindly permitting me to send the manuscript for publication; I am indebted to Mr. M.S. Prabhakar, M.A. in English, Gauhati University, for correcting the typescript; to Mr. Divya Kishore Singh. M.Sc.., Lecturer in Geography, Gauhati university, for writing the map of Assam showing the sacred religious centers: and to Mr. S. Shankara M.Sc. Lecturer in Physics, Gauhati university, for helping me in typing the manuscript. My thanks are due to the Director General of Archaeology to the Government of Indian and to Sri Ganga Prasad Sharma of the Gauhati University library, who have kindly lent me a few photographs of monuments and permission for the reproduction. We are thankful to Bharatiya Vidya Bhavan, the sponsors of this scheme, for providing us an opportunity to study this problems and to the Publishers and authors of works quoted in this book. We have tried our best to present the account in its true perspective and for any shortcomings we crave the indulgence of the reading public. Litterateur, historian, author and teacher, Dr. B.K. Baura received his education from the Calcutta and London University in 1948, he joined the Assamese Department as Reader and later became Professor. He also served the University in various other capacities. He went to USA in 1963 where he lectured at the Indiana University as Visiting Professor of Indian Folklore. Among his English works may be mentioned-A Cultural History of Assam, Vol I, Early Geography of Assam, Assamese Literature Sankarakeva-a Vaisnava Saint of Assam etc. In Assamese, his mother tongue, Dr. Baura is one of the foremost writers of novels, short-stories and plays. He has also edited a number of old Assamese classics. His work Assamar Lokasamskriti received the Sahitya Akademi Award in 1965. Dr. H.V.S. Murthy at Honnavalli, educated by Mysore University, took the Master's Degree in History securing the First position. He joined the Gauhati University in 1956 as Lecturer in History and worked under Dr. B.K. Baura for his Doctorate. He obtained his D.Phill. degree in 1961 and the thesis entitled Vaishnavism of Sankaradeva and Ramanuja: A Comparative Study is under publication. In addition to a number of research papers, he has also published A History of Ancient India and has collaborated with Dr. Baura in editing and revising gait's A History of Assam.